LaGrange, is a community in North Brevard County, it is an era as much as it is a place, it is a microcosm of all that went into forming these United States. The hardships and dangers confronting the early pioneers of LaGrange were no less than were those faced by early settlers in the other parts of the United States. 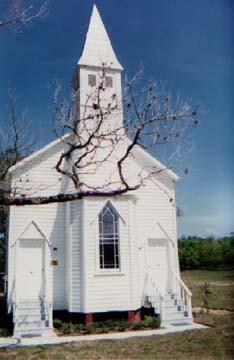 Everything that LaGrange was is represented in this picturesque church located on Old Dixie Highway just north of Titusville. 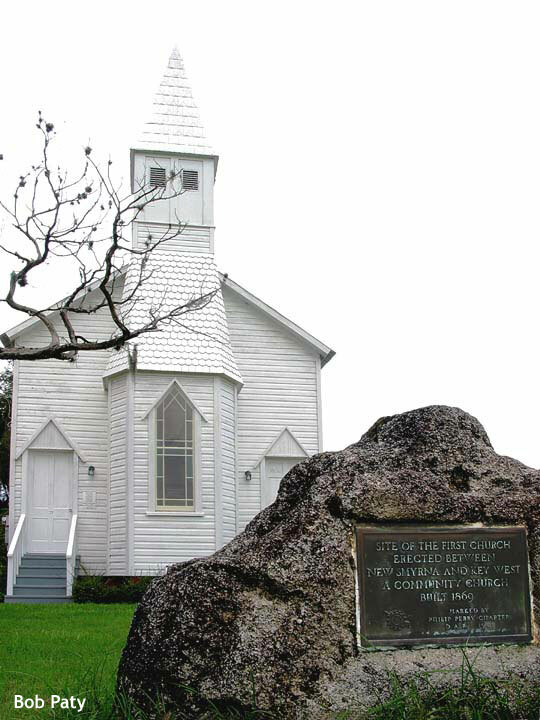 The LaGrange church first begun in 1869, is the oldest church between New Smyrna Beach and Key West and the oldest Protestant church between St. Augustine and Key West. Other than scattered Indians, there was little settlement activity in Brevard County until the David Nathaniel Carlile family arrived from Mississippi in 1852. He came well equipped to populate the area having brought his wife and ten children. The Carliles were followed by Feasters, Cuylers, Norwoods, Singletons and Warrens. The honor roll of early pioneers can be read off the gravestones in LaGrange Cemetery. The history of LaGrange is the thread that binds us to those who have gone before and made our lives possible. The LaGrange area was accessible mostly by water, with the St. Johns River being the primary north- south artery for people and goods. Salt Lake provided the closest landing for items destined for the LaGrange community. Goods traveled overland on a two wheeled cart puled by men. Oxen eventually replaced the men and to avoid the deep sand, wooden rails were put in place to make it easier to roll the carts. LaGrange Church was the social center for the early settlers. Non-denominational religious services were conducted for various faiths and all day meetings with dinner served on the grounds were typical. Food served was wild hog, venison, turkey and mullet served with cabbage palm, mangoes and sweet potato pie. To the forefront of this community rose a Baptist minister, The Reverend William Chaudoin, who for 33 Years served the LaGrange Community. His prominence was such that when he died in 1904, the trustees for the then fledgling John B. Stetson University at DeLand, named Chaudoin Hall for him. Those wishing to learn more about historical LaGrange, can join a conducted tour of the church and grounds the third Saturday of each month. LaGrange and its memories live on and are again being brought to the forefront by a group of dedicated citizens, The LaGrange Church and Cemetery Association has worked to restore the church and cemetery. 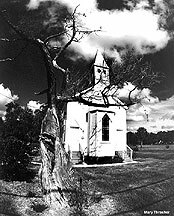 Through their efforts LaGrange Church is now on the National Register for Historic Places. 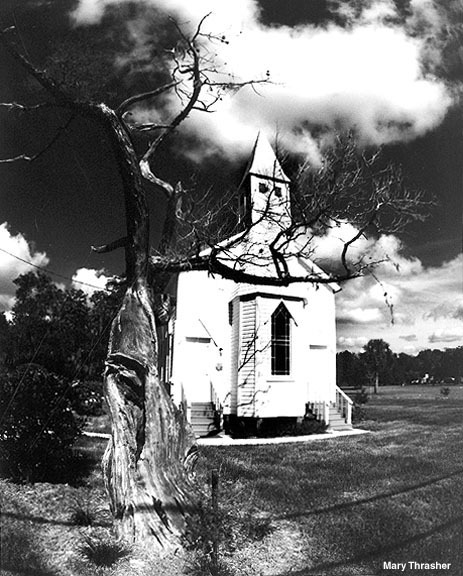 For special tours and lectures for groups of 8 or more, call David Ferguson, president of the LaGrange Church & Cemetary Association, at 321-269-9222. Family histories have been completed on the following pioneer families buried at LaGrange: Andrews, Battle, Brady, Carlile, Chaudoin, Cockshutt, Coleman, Crissey, Draa, Duren, Ellis, Feaster, Flood, Frensley, Froscher, Futch, Gardner, Goldsmith, Gruber, Johnson, Jones, Kyzer, Mims, Norwood, Price, Roberts, Scobie, Singleton, Titus, Warren. Open House is held the 3rd Saturday of each month, from 10 - 12 noon, free and open to the public. Special Tours and lectures for groups are available. For information please contact David Ferguson, president of the LaGrange Church & Cemetary Association, at 321-269-9222 (N.B. Funeral Home). Closed during the summer. Special events are listed on the Calendar of Events. 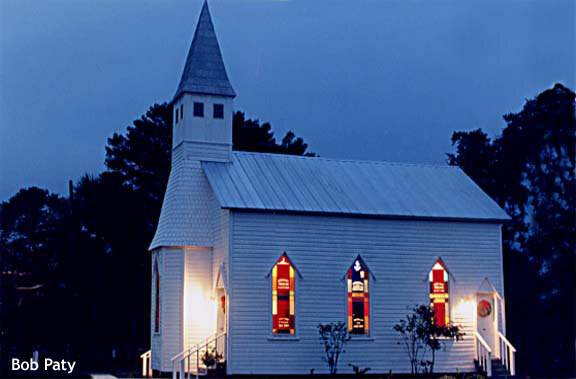 The LaGrange church is located 1575 Old Dixie Highway, 3 miles north of Titusville, just north of Dairy Road. A donation of maps, obituaries and funeral records for the LaGrange Cemetery was received recently from Richard Reinsch of Georgia (formerly a North Brevard resident). He presented the Museum with a database of all the information he has assembled for many years and also provided that valuable information on the form used for donations. In addition, Paul Marion and Marie Braswell organized the many notebook binders for the cemetery sections "A" to "H", assorted information on local cemeteries, grave markers and research work. These items, mostly handwritten, were compiled over a twelve year period by Pat Andrews and Rose Wooley (both now deceased). They were assisted by Marie Braswell in the research collection on site. Mr. Reinsch retrieved the collection from Mr. Andrews so it would be preserved. There are maps in a large map case remarkably done by hand. The amount of tedious work is unbelievable. This collection is of significant importance to North Brevard for anyone involved in genealogical research or just looking for gravesites of relatives or just anyone interested in looking for information about the LaGrange Cemetery. There is an Informational Index for the LaGrange Cemetery 1869-2013 by Pat Andrews and Marie Braswell available at the Museum.